I am in love with the fresh, fragrant, sweet smell of roses. I seem to be having some kind of love-in at the moment with anything rose scented! You may remember a while back, I posted about the gorgeous Crabtree and Evelyn Rosewater Handcream (here) and then I confessed about my pursuit of a perfect English rose garden whilst visiting the Chelsea Flower Show (here)....It's never ending! Whenever I buy a bouquet of roses for my home, sadly not all of them are fragrant and some I can only smell from very close up - unlike lilies or peonies which generally tend to have a very strong aroma. 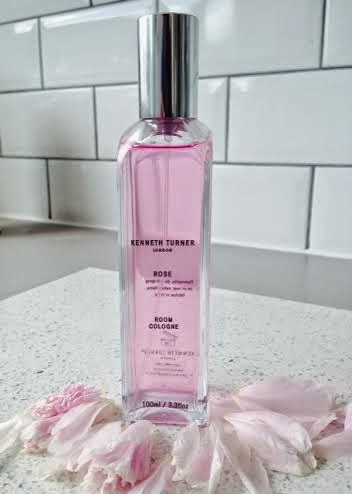 How glad (and intrigued) was I then, to come across this Rose room cologne from Kenneth Turner (below). I must admit, I didn't have very high hopes for this when I removed the lid to smell it. I am not a fan of faux floral scents, and imagined it to smell horribly saccharin and artificial. I am happy to say that I was very wrong and I was immediately hit with a very light and traditional rose scent that was not too sweet or pungent. It fills the room and really feels as though there is a real aromatic bouquet of roses in the room, rather than that of a ghastly air freshener aerosol that has been sprayed (my biggest pet hate - I loathe air fresheners, they are either eye-wateringly too strong or just smell really chemical and in most cases, smell so bad they enhance any bad smell you may be trying to cover up!). 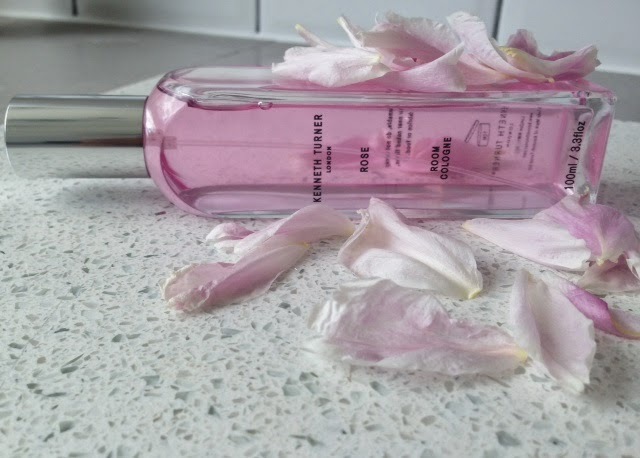 I love how when I walk into a room in my home now, there is a delicate summery hint of rose that envelopes you. It feels so fresh and quaint! I love the packaging of this room cologne from Kenneth Turner too! It comes in an elegant 100ml square based glass bottle with a chrome lid. This is not something you will want to hide away in your airing cupboard or under the sink! - It looks good enough to have on your dressing table mixed in with all your other perfumes. Now the original price for this is £18 - which I think is quite pricey for a home fragrance. However you are paying for the quality and brand - which to be fair is better than any you can ever find in your local supermarket. I was lucky enough to find this in my local TKMaxx for £4.99! I have just looked on the Kenneth Turner website and unfortunately it looks as though the Rose Room Cologne may have been discontinued? I am definitely going to go back and buy a couple more in that case as it will be a shame if it has. I am also going to buy the 'Original' which is a blend of poplar, honeysuckle, lemon and orange oils, clove and cinnamon which will be beautiful for autumn.